Just 24 hours and 48 hours before NXT Takeover War Games and WWE Survivor Series 2018 respectively, host Sean H. sits down and speaks with special guest and co-host of the #RingsideRevolution Podcast MJ. She shares with the masses her War Games and SSeries predictions, views on the controversial Nia Jax/Becky Lynch situation, Daniel Bryan’s unexpected WWE Championship win over AJ Styles and much more. In addition, Sean H. shocks everyone with his view of what a women’s championship main event at WrestleMania 35 would be. Does Sean feel the wrestling world is ready for the ladies to main event the biggest show in the history of WWE? Do MJ and Sean agree on their War Games and Survivor Series predictions? Do MJ and Sean argue on the air like they do on twitter? 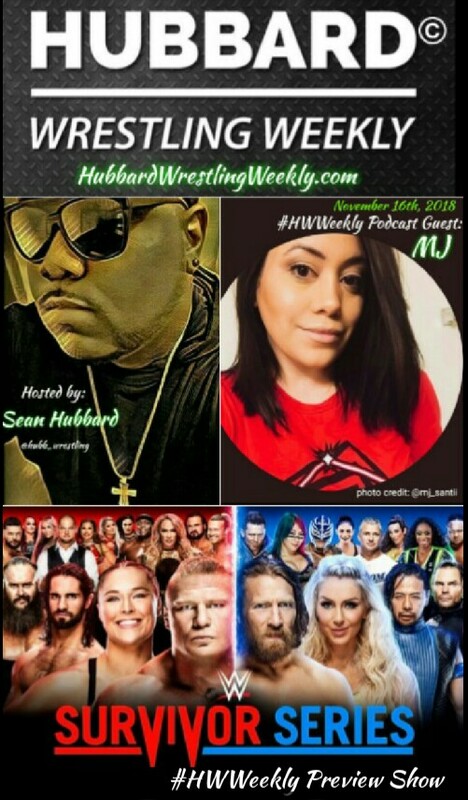 There is only one way to find out and thats to click play and listen to this explosive and entertaining Survivor Series Weekend edition of the #HubbardWrestlingWeekly podcast.